Plug to plug with female coupler. 1m White Coax F-Plug to F-Plug Cable Length: 1m Colour: White Ideal for use with satellite receivers, Sky, Sky HD, Freesat etc and Virgin Media / HD. A high quality 10m satellite cable, F plug to F plug satellite dish lead. 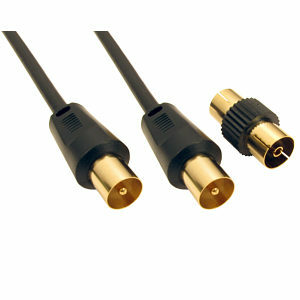 Features gold plated contacts and fully shielded, high definition PC-OFC coaxial cable. Ideal for satellite LNB connections on Sky, Sky Digital, Sky+, Sky HD, Freesat and other satellite receivers. 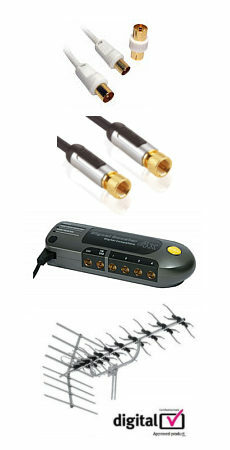 Suitable for cable TV connections such as Virgin Media.